What is the Sikh attitude towards Yoga? Just like hygiene, regular exercise, balanced diet, vitamins, Yoga is an activity that any sensible Sikh should explore and use, while being careful not to become obsessed with the bodily functions. For instance, a vegetarian diet, various simple forms of controlling one’s breathing, and good posture are very useful, and chastity is essential, to enable one for the higher energy of the Shabad (i.e. Naam). Sikh Path is liberal and progressive. The Gurus do not reject a healthy lifestyle through proper use of any science. We all know that science is still struggling to prove how accurately Guru Nanak Sahib Ji described the universe and biology in his verses, five hundred years ago. Gurbani supports the concept of Bhagti Yoga (devotional worship), Karam Yoga (virtuous actions), Janana Yoga (reflecting on knowledge & inner-self), and Raja Yoga (controlling the mind & living in balance). Bhakti, Seva, and Naam, extensively cited in Gurbani, cover the first three, not as Yoga but as a Gift, a consequence of God-Guru’s Mercy. This flows freely from a complete submission to the True Perfect Guru, Satguru. Yoga is, simply, a philosophical science. Like physical exercise, when used sensibly, it can help build a body and mind that are better prepared to receive, and share the spiritual energy with others. When practiced without submission, just like practice of charity, it can, however subtly, result in a stronger ego and thus keep us farther away from Truth. Raja Yoga is mentioned favourably several times in Gurbani, because of the supreme aim of Raja Yoga: As Patanjali said: “Yoga is removal of mind’s noise. Then the observer can return to a view of the Self.” At the same time, Gurbani names various limbs and segments of Raja Yoga as not conducive to Truth. The Sikh Path, as shown by the Ten Gurus, leads to the ultimate Truth through an inner death, then living abundantly and spiritually through the Guru’s command, breathing only whatever the Guru allows. A Sikh, on the Path, cannot bother with attempts to open some Chakra (energy level) or any other experiences related to different Chakras per se. Doing so, will divert him from a higher aim, Pure Love, which is at the innermost seat of consciousness, or should we say, at the highest energy level. What is the practical outcome of, the perfect knowledge of Truth, at the Sahasrara Chakra? Is it not Pure Love for the whole creation and a true humility toward all humans? 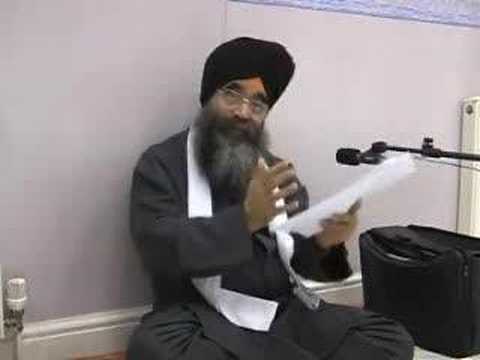 So, instead of taking detours, a Sikh does it naturally, through Love and humility, from the Guru, devotional singing of Gurbani with other devout Sikhs, and by loving devotional meditation on Naam (the GurMantar blessed to the seeker by the True Perfect Guru in the form of the Panj Piyaare). by breath (which is taught to the seeker by the Guru in the form of the Panj Piyaare), can attain this virtue. Naam will awaken the consciousness, and create love and affection for all those who are created by God. It is strongly believed that a pious person would be compassionate and contended. He will aspire to serve the needy. He will have no enmity with anyone, as he knows that God lives in every human being. To serve His Creation is to serve God and remember Him day and night. The individual can merge with God by loving Him, living in Him, by dying in Him, and singing his Divine Praises. The Sikh rises above a preoccupation and identification with the body and mind like Yogis do by “selling” it to the Guru in exchange for a perpetual supply of (spiritual) Naam, engaging in extensive Seva (selfless service), and following the Gurbani to the letter. This is also called Sehaj Yoga, or the Natural Yoga. A Gursikh is not deprived of any inner body experiences, if that is his Guru’s will. If there is a need, the Inner Guide shows all the required disciplines. They are practiced naturally by following the Guru’s command, rather than through a personal attachment with the body. Verbal details of these practices are not intrinsic to the Path. This is why Gurbani does not dwell on this subject. For some, the direct way is too simple. Many seekers are more inclined toward physical exercises and controlling the energy, or holding a rather intellectually spiritual (Zen, for instance) stance, rather than Naam Simran in pure love and devotion, until by Waheguru’s Grace they witness Pure Love living within. Still, they should clearly regard all Yoga practices as what they really are, a separate science, not as a requirement on the Sikh Path. Yoga practiced by Yogis is no way related to Sikhi or Gurmat. Some will enjoy the honey, while others study the honeycomb and practice various approaches to it first. « What is the advantage of being a ‘Sardar’ in this world of fashion?